Last night as I was snapping the foxgloves outside the garden, a keen wind blew up. 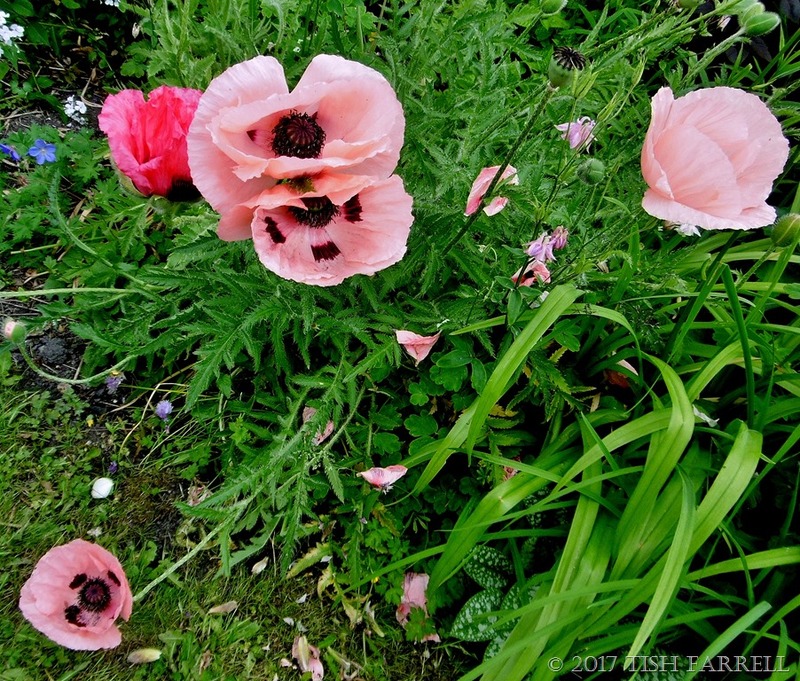 Inside the garden the oriental poppies were in complete disarray – a veritable strip-tease was going on. 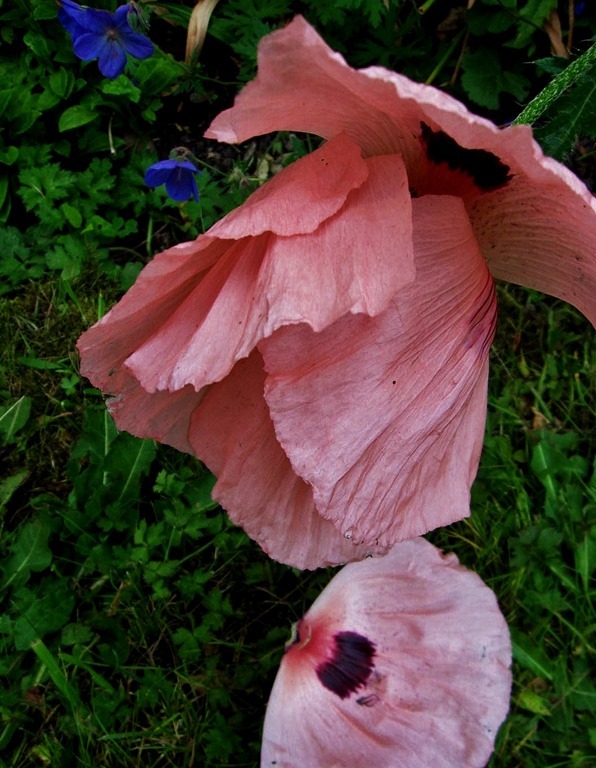 Of course it often happens – just when the poppies are looking their best, we have gale or deluge, and the garden party ends up a complete wash-out: everyone with draggled skirts, hair-dos shot and mascara smudged. …there were new girls on the block, including one in lipstick pink. How could I have forgotten that she would be coming along? Although how she got herself in with the salmon pink crowd I do not know. 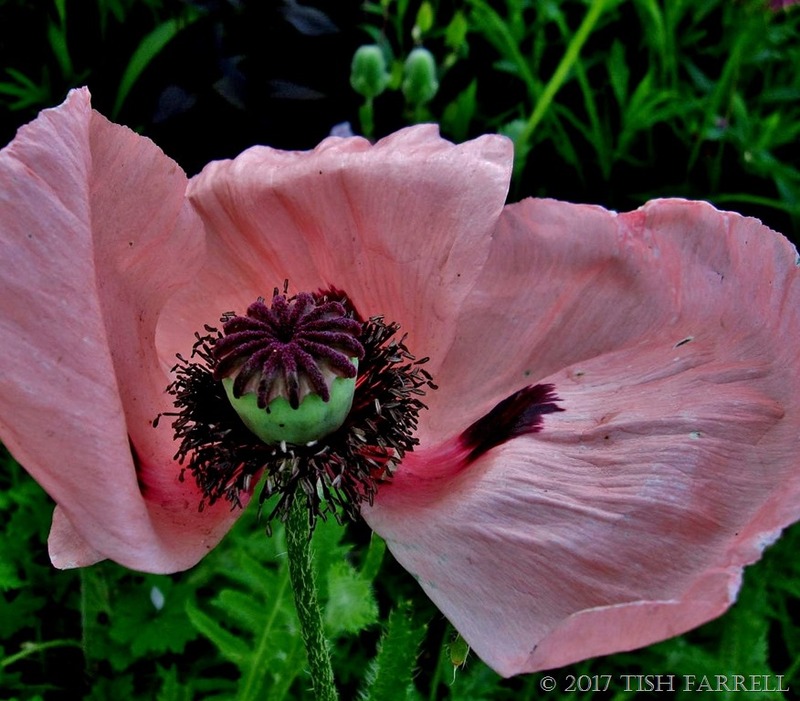 While I’m here, I’ll pass on an oriental poppy gardening tip for those of you that grow them, and may not know: if, when the poppies have finally finished flowering, you cut the plants right down to the ground, you will be treated to a late summer flush. Cee’s Flower Of The Day Please visit Cee to see her lovely flower shots, and leave links to your own. 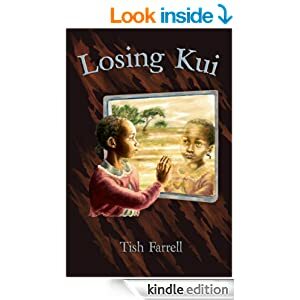 Posted on May 31, 2017 by Tish Farrell	This entry was posted in Gardens, Humour and tagged poppies, Tish Farrell Writer. Bookmark the permalink. 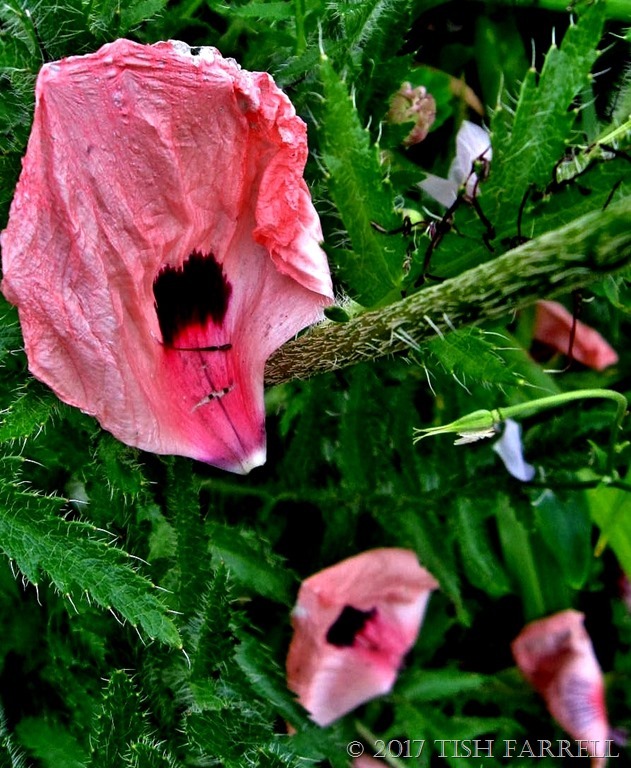 Good for your pics , let’s say the truth…, particularly because the poppies recovered so well ! They are exquisite. I adore poppies. Tish you have some real nice poppies. Time I did some more ….. Flower of the day indeed, and you anthropomorphise (what’s the female version of this?) them beautifully. That single one with just one petal missing is a particularly superb photo, as is the one with folded petals and copper-sulphate blue onlookers. I share with poppies: the day after my hair looks perfect, it needs a trim. Invariably. I’m crazy about poppies, but for whatever reason, I’ve had no luck with them leaving me to admire other people’s. 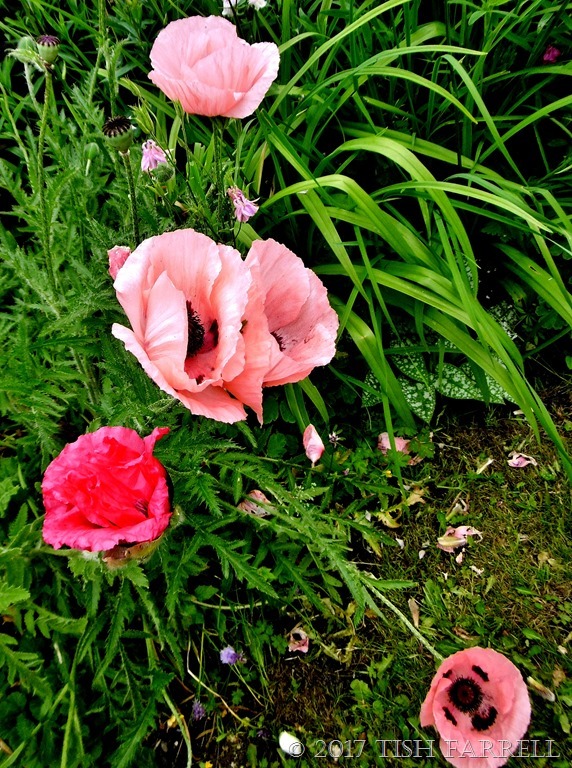 I’ve never grown poppies, but they used to grow wild in the Galilee. They were all scarlet and it was almost a carpet. They have a certain something don’t they. I imagine them in silk. Mmm.